Sometimes these scene-by-scenes are really line-by-line and moment-by-moment. This will not be one of those. This will be a quick scan through the whole film while I pull out the bits that stood out to me and the interesting things I noticed, and bad things I hated. We open with a voice over saying it’s 1795, the British East India Company is taking over India, except for Made Up Kingdom which is holding firm against it. And in Made Up Kingdom, little Fatima is building a mud fort while her father Ronit Roy watches and helps. We immediately get a sense of Fatima as a strong confident child who is very loved by her father. And has a strong sense of duty towards her kingdom. I am interested in this little girl! And then we see Ronit Roy playing with a map, carefully outlining the borders of his kingdom. Which is interesting, because of course one of the weapons the British used was cartography, drawing maps and boundaries and claiming territory on paper before claiming it with guns. Ronit’s wife comes out to talk to him, asking where their son and Amitabh are, Ronit explains he had no choice but to send them to the neighboring kingdom to ask for help, but at this point they are gone so long he has no more hope. This whole sequence of scenes is so perfectly acted and costumed and everything. They are dressed and made-up like royals, but not over the top or extreme, just nice silk clothes. They are talking nobly, but still human, worried, sad, but keeping it inside. A level of acting and clothing that we will never see again! Ronit Roy leaves his beautiful white palace to run downstairs to his basement work room where his men are secretly making swords. He strides through with an automatic unthinking confidence and nobility, until he reaches a small platform and gives a speech, begining “Friends!” This is the kind of ruler and leader we want! No need to talk down to his people or enforce rule through fear, his people are his friends! Anyway, his speech is interrupted because the British are here! Evil Lloyd Owen has arrived with his men to have tea. Ronit Roy prepares his men to attack when he gives the signal. Lloyd Owen greets him in careful Hindi. I love his Hindi. Him and Other White Dude actually made an effort. And it is also a bit hilarious to see someone in a formal British army uniform speaking Hindi. Blah blah, threat threat, Ronit Roy has a great acting moment when Lloyd Owen throws a leather notebook on the table and he kind of shrinks into himself and then braces himself again. And a moment later we learn that notebook was his son’s and he now knows that Lloyd Owen has his son. And Lloyd knows that they were planning rebellion because of a kind of lame poem his son wrote. Lloyd then reveals Ronit’s son who is tied to the front of a cannon. With this pressure on him, Ronit signs his surrender papers to the British, at which point Lloyd promises to “free” his son. Only, of course, it was a trick and what he actually does is set off the cannon thereby “freeing” his son from life. And the son’s last word is, of course, “Azaad”. We don’t see the actual cannon shot, instead we see the shocked reaction of his mother, and the broken reaction of his father and he pulls his sword and orders the attack. Lloyd Owen pulls his gun and in a beautifully shot moment, Ronit’s wife kind of spins in front of him and is shot. She isn’t exactly trying to protect him, but also not-not trying to protect him, it is all just happening so fast. Ronit takes two shots but keeps going until Lloyd drops a tiny gun out of his sleeve and shoots him point blank in the heart. All of this is lovely, all of this is perfect. And then, suddenly, the movie becomes about 30% worse in the next scene and never really comes back from it. Starting with the edit, little Fatima is supposed to throw herself on her father’s body. But they cut it a little too long, so instead with have this half second of the little actress waiting for her cue, calmly sitting, before suddenly dramatically throwing herself on the body. Followed by her angrily trying to raise her father’s sword, but she can’t lift it because it weights TEN THOUSAND POUNDS or something? It’s just SO STRANGE. We can see the sword isn’t that big, there is no reason for her to be straining like that. Why in the world would the director tell her to lift it two inches off the ground before giving up? She should be struggling to lift it but succeeding, not acting like it is glued to the ground! Oh, and then Amitabh shows up. Big dramatic intro scene, riding his horse into the city, arriving just as little Fatima gives up on the sword and literally screams her defiance to Lloyd Owen while he prepares to shoot her. Amitabh’s arrival inspires the troups to fight back, Fatima runs along the wall of the fort, Amitabh shoots a rope free, she leaps for it, swings down behind him on his horse, and they ride out as the remaining guards fight to cover their escape. This should be a great action scene, but it’s not. There’s just something slightly off about the rhythm of it all. Everything is either in slow motion, or jump cut so you miss it. We see little Fatima slowly swing out on the rope which cuts down on the excitement of the moment, making it seem like a gentle glide instead of a desperate leap. And then we cut to her riding the horse behind Amitabh instead of seeing her land. I understand why, Amitabh and this child actress are both of them incapable of real stunts, so they just cut to them riding the horse together. And I suppose the slow motion might have been easier to do in CGI for some reason, or at least killed time instead of doing multiple things in that same one minute period. But it’s BORING. And all the action scenes are like that, the best bits are either so slowed down that they aren’t exciting, or not shown because the actors can’t handle it. Oh, and the weird extra moments, showing the actors preparing for their moment of action instead of just doing it, that continues too. Blech! But the real problem arrives after little Fatima and Amitabh have galloped out of the fort. We get a nice “11 years later” message, and then Aamir. Blech! Oh, by the way, actually historically accurate! I looked it up, and the East India Company was at a peak of military power by 1803, if this is 11 years after 1895, then that makes it 1806 and it’s actually accurate! By now, the East India Company controlled large territories with military rule. Like here, when Aamir and a long group of travelers are blocked from traveling on the roads by a British toll gate. I was watching carefully on my second go around and Aamir is actually kind of amusing and interesting for most of this first sequence. He starts by double-talking the gate guard, claiming his donkey is his “Nawab” because after all after the British arrived all the Nawabs became donkeys, why couldn’t a donkey be a Nawab? It’s a nice little speech and symbol of how Aamir is smart enough to see through both the British rule and the Indian rulers. And then Aamir attracts the attention of the wealthy merchant who is traveling with many people, he offers to pay Aamir’s toll and let him travel with them. Aamir charms them, then pulls out his flute and plays a signal to bring in the band of Thugs who strangle or knock out all the merchants and steal things from them. Aamir bargains for the highest possible payment for all the merchants he brought in to their trap, then goes riding off to meet with his British contact Gavin Marshall and hand over all the Thugs for a second reward. There are a lot of nice little character touches here, he walks through the Thug attack without fear, or much interest. He gives a little casual advice to a victim to continue to play dead, showing he isn’t bloodthirsty, but he also steals a ring from another victim, showing he isn’t above thievery. However, there are also a few clumsy moments. For instance, he steals the ring with a comment about how the thugs are so blind to miss it, but the camera catches a long pearl necklace that the victim is wearing in the same shot. Why steal the ring and not the necklace? Well, because this film was made so shoddily, no one thought to remove the other jewelry this character was wearing before doing this scene, and no one noticed or cared about it later either. The real problem is after Aamir meets the British contact. So far, everything was clear and tidy establishment of character. Aamir is smart enough to see through and not respect any power, British or royal, that was the point of his first speech. He is charming enough to fall in with any company, that’s why we see him with the merchants. He is amoral and uncaring what happens to anyone else, that’s why we see him stroll through the attack. And he is willing to sell out twice, first the merchants to the Thugs and then the Thugs to the British, he is smarter than everyone else and doesn’t care about anyone. Fine, good, amusing and important in establishing the character. But then we have just one more scene, showing Aamir meeting with Gavin Marshall and talking him out of more money by telling a sob story about his grandmother. And this is the exact moment that I lose interest in his character. It’s just too much, there’s no reason to include it because it just shows us stuff we already know about his character and doesn’t add any more plot points. The only reason it is there is because Aamir fell in love with his speeches and tricks and forced into the film just a little bit more of his character. And then, yaaaay! A good scene. We cut to a shipyard where the overseer is complaining about an object that doesn’t have the right paperwork to go on the ship. And then the clothe is pulled off to reveal a magnificent statue, horses and fighting men in layers. The overseer is stunned by the beauty of it but still won’t let it on the ship. And then it starts to rain and the mud washes off the face of Amitabh and Fatima at the top of the statue, this is their clever disguise, pretending they are a statue in order to get on the boat. But I guess since they aren’t allowed on the boat after all without a receipt they have to attack sooner? Could be interesting statement on how the British used paperwork as their greatest weapon or could be just poor plot thought. Anyway, fight! Fight fight fight! It’s not terrible, but it’s not great. All of these moments when things slow down for no real reason. Like, there’s a moment when Fatima has to roll across the deck, grab her bow, and shoot 4 arrows simultaneously at the soldiers who are about to shoot Amitabh. And instead of seeing it as one move, we have Fatima bracing herself for the roll, rolling, pausing, looking for the bow, struggling to stand up with it, and then taking aim, and we don’t actually see the arrows in the air. It’s just so awkward and strange!!!! I don’t know if the problem is with the post-editing, or with the training for the fight scenes but something is terribly wrong. The next scene is also terrible, but in a “so bad it’s good” way. Lloyd Owen is playing classical piano while talking with Sharat Saxena about the horrible rebels. Sharat talks him out of guns to help track them down, but turns away with a disgusted look on his face that reveals he is with the rebels and only pretending to hate them for the sake of the British. That parts fine, but what I really love is that Sharat leaves the room and Lloyd Owen and Gavin Marshall continue to have a long conversation about how they don’t trust him and he is secretly with the rebels but they are using him as bait to capture the rebels. IN HINDI!!!!!! Two British army officers speaking Hindi together in a casual private conversation is weird to begin with, but why would you speak the one language that your enemy knows while plotting against your enemy???? It’s just STRANGE. I’ve decided the British army must have had an extremely tough language immersion policy so that officers, even while alone together, must always and only speak awkward formal Hindi instead of English. Oh, and the conversation ends with Gavin Marshall suggesting that they set a trickster after the rebels, obviously meaning Aamir who he is already using to capture Thugs. And now Katrina. First an explanation that she is giving a private performance to only the British, then her aunt calling for her to come out and dance while a roomful of drunk British idiots chant for her. She is lounging in her bath, the way exotic dancing girls do, and slowly getting ready. Could be seen as a subtle act of rebellion against British rule, to be late to perform for them, but the film doesn’t bother enough with Kat’s character to even give us that much of a clue to her motivations. At least, I think this is Kat. The first reveal of her face, flinging her hair back in the mirror, honestly she is unrecognizable. I think she must have done something temporary to her lips maybe? I know it’s temporary because in the trailer for Zero she looks exactly like herself. Anyway, Kat swans around getting ready and opens her closet to find Aamir hiding in it. He flirts with her, she slaps him, he apologizes for not being around, and then they happily land on the bed together briefly before she flings him off again saying he isn’t really in love because he is too cowardly to say his feelings in public. And then she goes off to dance and IMMEDIATELY Aamir is there grabbing her hand and dancing with her. There is not one moment of Katrina coming out and dancing her intro alone, Aamir is there right away. It is just the ODDEST dance. The moves are extremely complicated and physically difficult, and yet also not graceful. And while Kat is doing all of this really really hard work, Aamir is dancing on and off and just kind of stealing the spotlight from her. Not from her character, from Kat the actress. All she has in this film is her two songs, and she doesn’t even get those, Aamir takes that away from her too. The other really really disturbing thing is that this sequence is about the wrongness of the bad white men entertaining themselves by watching an Indian woman dance, excluding all native Indian men from the audience. The way the performer is othered by the audience, the way anyone who might relate to her as a person and vice versa is kept out. Only, of course in reality this is a white woman dancing for an all Indian audience. Othered and sexualized in the exact way that this film is saying the British are “bad” for doing. At the end of the song, Aamir is recognized and runs around from the British soldiers in fast forward like it’s the Marx brothers or something, before being arrested, and then suddenly in a coach with Gavin Marshall being offered the job of capturing Amitabh. Such an odd edit! Why in a coach? Why not in an office or really anywhere else? Maybe there is a scene that explains it that they cut? Anyway, Aamir takes the job after holding out for a lot of money. And then demands assistance from a friend who can read the signs of nature. And this whole thing goes on so looooooooooooong. It takes 5 times as long for the dialogue to get to the point as what we actually needed. Heck, this whole scene could have been cut, we could have gone straight from Aamir being arrested to him meeting Mohammed Zeeshan Ayyub in a cell and offering him to join him on a mission. Oh right, Mohammed Zeeshan Ayyub. I love him as an actor, he was great in Raees. But oh my gosh could I do without his character in this film! A drunken cowardly Hindu Pandit who has a ridiculous accent. 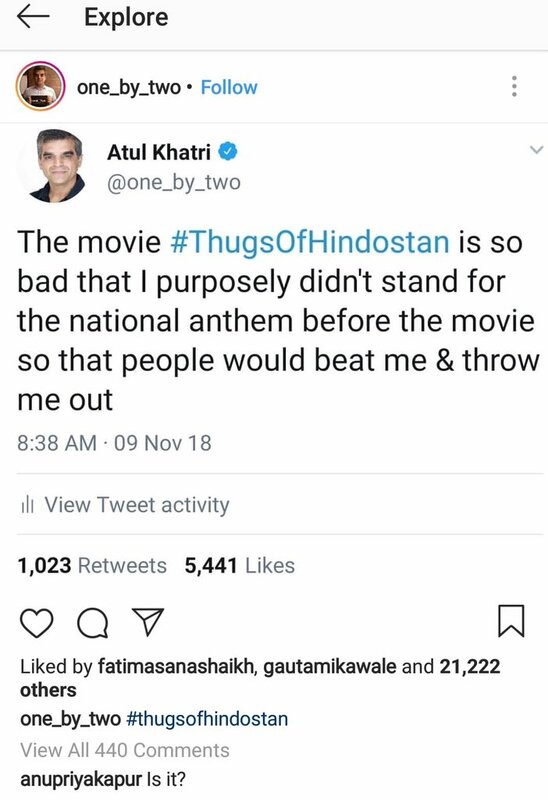 Aamir was already irritating, and now we have double the irritation. Especially since Mohammed’s main job is to set Aamir up for even more irritating character things, like learning in their first meeting that Aamir set him up to go to jail, and stole his fiancee. I just, I don’t care. And on that note, I am finished with my first section of the film! I think this is going to end up being a 3 part series, so we should be done soon, maybe tomorrow, Monday at the latest. Fun fun! 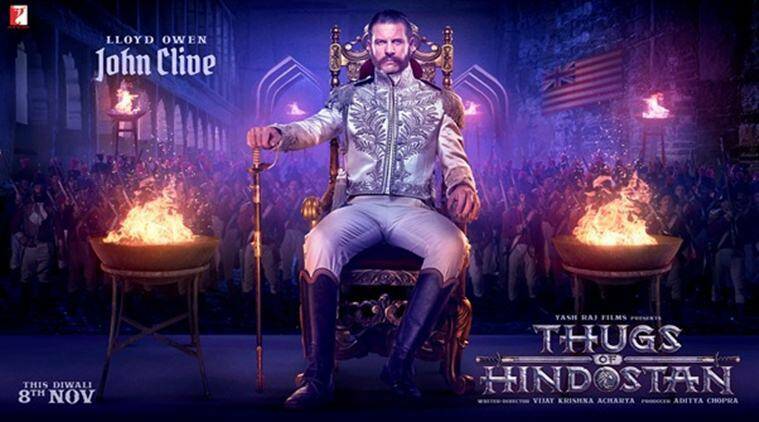 This entry was posted in Uncategorized and tagged Aamir Khan, Amitabh Bachchan, Fatima Sana Sheikh, Katrina Kaif, Thugs of Hindostan by mredlich21. Bookmark the permalink. Her role in Dhoom 3 wasn’t great either. She had no backstory, no motivation. But at least she got one glorious dance number all to herself, and a sympathetic character (what little we knew of it). Thanks for doing this scene-to-scene…it gives a good understanding for so much disappointment. No, for friendship! Dina is a big big Aamir fan and there is no way for her to see it in theaters unless I give her a ride to the theater. So I made the ultimate sacrifice. Although I was tempted to drive her there and then just sit in the lobby reading my book until she was done. Not just Katrina. Fatima is also upset. She was liking troll posts about TOH being such a bad film on instagram. Hmm. I’ll be cautious about fully believing anything on twitter, but definitely interesting if true.